cohen is sick, i was going to say sicker than a dog, but once again i have to ask, what does that mean? so let's just say sick, liquid goo covered face, limbs limp, whiney sick. i guess it started sometime last night and has slowly progressed. this is his first cold, and the truth is that cohen is quite cute when he is sick. so clingy and non-active. he cuddles into me, clutching tighter and tighter until i start to loose circulation. he rolls around the bed with his eyes half open moaning a song to himself. sure it isn't pretty, and it certainly isn't his usual self, but it is nice to be so needed. for him to be so docile. i say this today, i am sure by tomorrow (after what will probably be a sleepless night) the story will read different. so today is eleven month day. unfortunately there were no great adventures to report back on, mostly just a lot of moaning and sleeping. 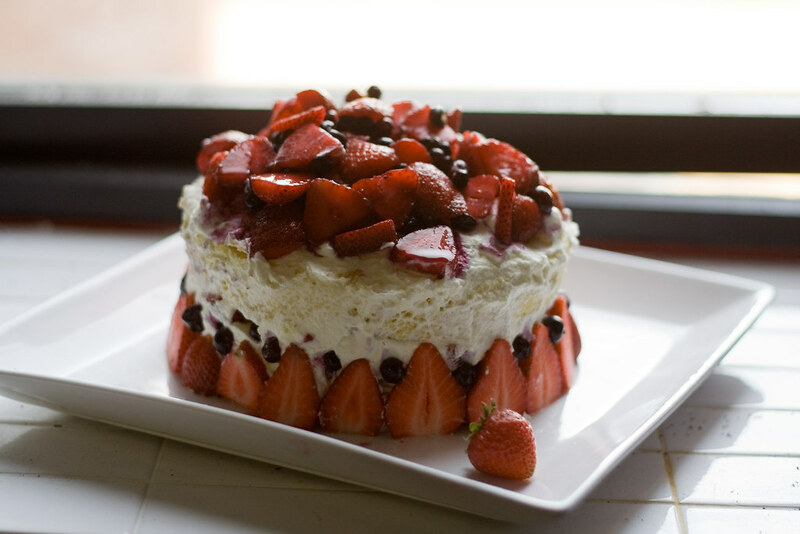 i did make a strawberry/blueberry shortcake though, in preparation for the one year cake. i figure if we practice now by the time june 16th rolls around he will be ready to eat the whole cake himself. for today though, he settled for one piece, whipped cream and all. happy month day to you! let's hope he doesn't share whatever it is with you. Mathias had a throat infection last week. Was put on antibiotics for a week. He shared. So now I'm on antibiotics for the next week! Hopefully Nick doesn't get it too! Good thing we're in for a long weekend! what a lucky boy for a sicky! that cake looks amazing. can't wait to see what you decide to do for the big day.